Councilwoman Caren Ray and Patty Welsh marching in the Harvest Festival Parade. Mayor Jim Hill and Councilwoman Caren Ray are in a heated race for the mayor’s seat. The election is on Nov. 6. Dressed in black, Patty Welsh left a city council meeting on Oct. 9 and allegedly drove around Arroyo Grande tossing Christmas ornaments filled with brown paint at Jim Hill for mayor signs and property in the vicinity of the signs. At Tom’s Auto Service, after the owner refused to allow Welsh to put a Caren Ray for mayor sign at his business, Welsh allegedly threw paint on both a Jim Hill for mayor sign and a sign for Tom’s Auto Service. As officers and public officials left city hall after attending a new officer swearing in ceremony, the wide-spread vandalism was discovered. In all, Welsh had allegedly damage property at 11 different addresses. Witnesses told officers Welsh had threatened to steal Hill’s signs and had been seen leaving the City Council meeting early, according to court records. “Welsh has a history of vandalism and is a very vocal critic of Jim Hill,” officer Vincent Johnson wrote in a search warrant affidavit. At 1:45 a.m. on Oct. 10, officers went to Welsh’s Pradera Court home and searched a grey trash can she had pulled to the curb. 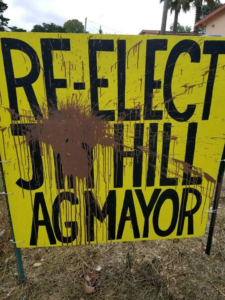 Inside the can, officers found a rusted out paint can with the same color brown paint that the vandal had used to destroy mayor Hill’s signs, according to the affidavit. Later that day, officer Bradley Hogan knocked on Welsh’s door and asked her to step outside. She refused to step outside. “Welsh appeared nervous and while speaking her and her voice were shaky and weak,” according to the affidavit. Welsh refused to answer the officer’s questions about why she damaged the property and if someone else had put her up to the vandalism. When asked if she would tell an officer why she damaged the signs, Welsh shook her head, “indicating a nonverbal no,” police wrote. Officers then began searching for surveillance equipment and reviewing videos. 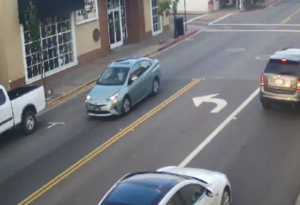 On one video, Welsh’s 2017 Toyota Prius is seen at the site of a vandalism on East Grand Avenue, “and then fleeing eastbound approximately 90 seconds later,” according to the affidavit. Welsh’s Prius was captured on video at several of the vandalism sites. The San Luis Obispo County District attorney’s Office is currently reviewing the request for a felony vandalism prosecution. Welsh hung up on a reporter when asked about the allegations. Caren Ray’s campaign manager Shirley Horacek said they do not want their campaigners vandalizing her opponent’s property. Don’t miss investigative news reports, sign up for our weekly email blasts. DO NOT vote for Caren Ray! I agree with Ted R, I think the whacky, far-left SLO County Progressive candidates do a little smoking off the pipe, and that is why we see the aberrant behavior coming out as this campaign winds down. Sad. In my opinion, Caren Ray lacks the maturity, wisdom and judgement to hold public office. If you scrutinize her public service career, she has issues with behavior, judgement and she chooses to associate with people of suspect character. This latest scandal features Caren pictured with her close friend and supporter Patty Welsh, and now Patty is going to be charges with multiple felony counts for damaging ‘Jim Hill for Mayor’ signs and other assorted damage to our beautiful village. What kind of politician supports her followers behaving that way. Fortunately, Arroyo Grande has a proven incumbent mayor, Mr. Jim Hill. Mr. Hill has the wisdom, judgement and experience we seek in our public officials, and he will continue to provide the steady leadership we need, with no scandals and felonious behavior. Elections have consequences, so choose Jim Hill on Tuesday, November 6th. Sweet! Mary Lucey’s whacky bud (pun intended) gets popped! As soon as these two teamed up to take down Hill you knew it was all gonna go up in smoke. The more I learn about Caren Ray, the less I like her! I will cast my ballot for Jim Hill, he has integrity. Henceforth I will always refer to seafoam-colored Prius’ as “Pattywagons”. This could very well be the first felony ever committed in a hippy-mobile. Yes, if you don’t conform to the Party dialectic, you will be battered with profanity and physically abused until you comply. Vote these fascists out of office – that includes Ray and Adam Hill. Maybe she knows who’s been ripping up the No On G signs in our neighborhood. Sounds like something she and her leftist friends would do. Ha! Oh my! A great example of no integrity. See ya’ Caren Ray! The hate doesn’t get any worse than with Caren Ray. Don’t forget her husband Randy Russom who stole $100,000 from his ex and whose company is the head architect for developers like Gary Grossman. It’s time that you drop out of this race now Caren! You are finished. Even the teachers in your school district dislike you. WOW! That is some bottom of the barrel nastiness. Is this how desperate Hill supporters are? This is small town mayors race folks.